"What is there to say, they are great cookies that stay soft and a have a smooth chocolaty taste." In a large bowl, cream together the butter, shortening and brown sugar until smooth. Beat in the egg and vanilla. Combine the flour, baking soda, salt and cocoa; gradually stir into the creamed mixture. Drop by rounded spoonfuls onto ungreased cookie sheets. Bake for 8 to 10 minutes in the preheated oven. Allow cookies to cool on baking sheet for 5 minutes before removing to a wire rack to cool completely. When cookies are cool, dust with confectioners' sugar. See how a dash of cayenne pepper really draws out the chocolate flavor. These weren't exactly fabulous cookies. They turned out a little crispy and were flatter than I anticipated. 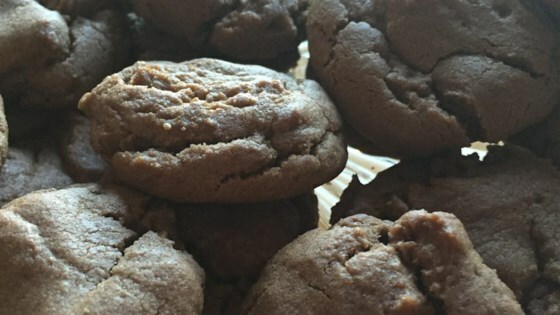 My husband said they were just ok.
My family loves these cookies - great recipe, thanks!